It may be the first thing you do in the morning, right after rolling yourself out of your bed. You shuffle into the kitchen where the Nespresso machine is waiting on the counter to make that first cup of the day. Add a couple of splashes of cream and a spoonful of sugar, and you’re ready to face the day. Coffee can be what wakes you up and gets you going in the morning, providing you quick energy with some caffeine and the sugary sweeteners you add to make your drink just right. But, Can You Add Honey as a Sweetener to Coffee? Let’s see the results! Sugar is probably the most common natural sweetener used with coffee even with the availability of several artificial sweeteners, many of which are based on natural ingredients. With the rise of a more health-conscious public, we may not be doing ourselves, or our coffee, a favor. Using sugar as a sweetener for your coffee isn’t always the healthiest choice. It is primarily made of sucrose, which is not as sweet as other natural sugars so you may use more than necessary to reach the desired taste. Sugar is low in calories and may be hard to digest. Added to the already acidic coffee, it may increase the incidence of stomach upset, especially on an empty stomach. With a rise in diabetes and obesity, perhaps it’s time to re-think exactly what you use to sweeten that bitter, black beverage. So, how would you replace the sugar in your coffee without potentially sacrificing the sweetness factor? There are several alternatives, some of which are considered natural since they are processed from natural sources like sugar. Replacing your regular sweetener with honey may have some additional benefits. Honey is already a widely used remedy for any number of internal and external needs. Its antibacterial properties make it ideal for topical treatment of wounds. It can contain pollen, which, when consumed, can help the body build defenses against seasonal allergies. Honey has been observed to soothe coughs from allergies or even colds. It requires very little processing before it can be used. In fact, it can even be eaten raw but is usually pasteurized for safety. Honey contains fructose, which is much sweeter than the sucrose found in sugar. Because of this, you would likely use less of it, which may counter the higher calorie content. This, in turn, may affect the unintentional side effect of weight gain often associated with coffee drinkers. This is not due to the coffee itself, but all the additives used to make it sweeter such as cream or sugar. Honey also comes in different flavors. This all depends on the type of flower the nectar was gathered from. So if you’ve ever tried honey before and didn’t find it to your liking, try a different variety. It may take some trial and error to find one which compliments the flavor of your favorite coffee brew. Another reason to choose honey as your coffee additive maybe its low glycemic impact. On the GI scale to 100, it scores at 19 whereas processed sugar is a 60. This means that it has a lower effect on the insulin your body produces and won’t give you that sugar spike and crash like white sugar might. Coffee has been shown to have an impact on insulin sensitivity which may help prevent diseases like diabetes. With the effect sugar has on our bodies, it is not the best choice for the prevention or treatment of this disease. With a lower glycemic effect, honey can add the taste you want and still keep the preventative properties of the coffee intact. 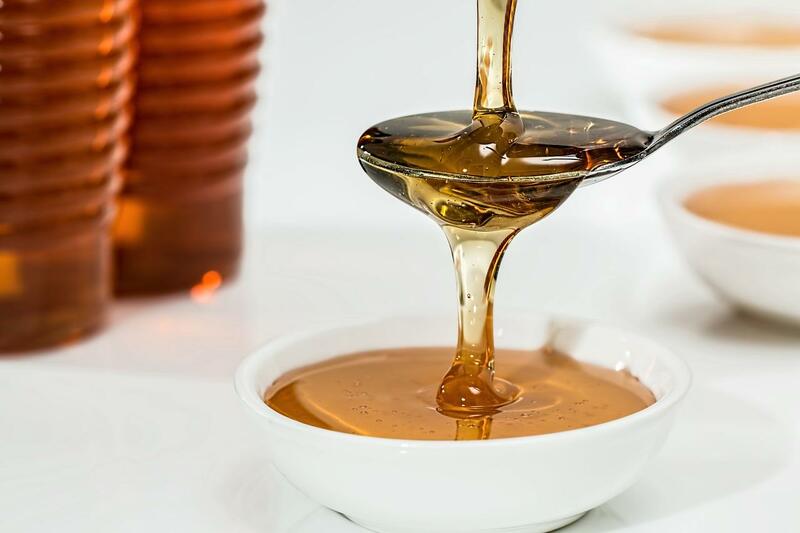 If you’ve been a long time coffee drinker and have begun to develop stomach issues such as heartburn or ulcers, the switching to honey might help with those issues. Coffee is acidic and sugar is not easy for the body to digest. Honey is easier to digest and comes with prebiotics which helps break down food in conjunction with the enzymes already available in our body. It also encourages beneficial bacteria in the gut which may help with intestinal distress. Coffee already helps your intestinal health by getting your bowels moving and honey can be a beneficial addition. In conjunction with the potential allergy relief of honey, coffee has been shown to help open airways and may improve breathing. It seems that the properties of both would be most beneficial for those afflicted with yearly allergies or even mild asthma which may otherwise be controlled exclusively with over-the-counter medications. With the number of benefits to honey, it seems like it is a natural and healthy replacement for sugar in our daily coffee. We have the possibility of alleviating allergies, imbibing vitamins and minerals not available in processed sweeteners, and helping our digestive health with an easy to digest substance which includes prebiotics to make digesting our other food easier. Coffee may have a positive effect on our bodies in regards to diseases like diabetes. Honey can add to that by having a smaller impact on blood sugar. It seems like honey could be the answer to enjoying a sweet and healthy cup of joe. Learn more why you should use honey as a coffee sweetener here!